The city of Cambridge, named after the old English university town, spans along the banks of the Grand River in the South-Western part of the province of Ontario. God gifted it with beauty, hence it is one of the richer cities in Canada. It was the home of the North American Indians for more than ten thousand years where the native population had hunted and fished in the beautiful Grand River for centuries. The first settlement in the region of what is now the municipality of Waterloo was named “Cambridge Mills,” which was founded about 200 years ago. Later, numerous villages and suburbs developed, which are now part of Cambridge. Hence, in many quarters of the city there is interesting architecture dating from the XIX century, which makes Cambridge a beautiful and pleasant place for living. Cambridge has a population of about one hundred thousand, the majority of which are from Anglo-Saxon, German, and Spanish speaking areas. It is mostly an industrial city, having light industry, but agriculture also plays a significant part in its economy. Cambridge is a city of numerous parks and expansive green areas which stretch throughout the suburbs, as well as the towns of Kitchener, Waterloo, and Guelph. Waterloo is one of the biggest and most significant university centres in Canada. Many students of Macedonian descent, future potentials of Canada, have acquired their university degrees there. At the same time, about 200 Macedonian families most of which from the areas of Lerin, Kostur, Voden, and other places in Macedonia, migrated here. The initiative for foundation of a Macedonian orthodox church in Cambridge was there a long time ago. A number of Macedonian families used to travel hundreds of kilometres to satisfy their religious needs in their own mother tongue, Macedonian, by attending the Macedonian orthodox churches of “St. Naum Ohridski” in Hamilton and “St. Clement Ohridski” in Toronto. Hence, the great desire for their own church was present in these families from the Belomorie region of Macedonia. In the case of a number of families, Greek influence and propaganda contributed to strengthening their love toward the Macedonian orthodox church. Thus, as early as 28 July 1987, a group of Macedonians who used to meet at a Macedonian barber’s shop in Cambridge decided at first to establish a Macedonian club. The aim of this newly-established association was to become a meeting place for the Macedonians from every part of Macedonia, who lived in Cambridge, Kitchener, Waterloo, and Guelph. The news of the establishment of this Macedonian association was met with negative reactions among the emigrants of the neighbouring countries. However, thanks to democracy, the establishment of this association was given room in the Cambridge daily media. This stirred the interest of a large number of Macedonians, many of which joined the association immediately. It was as if the establishment of this Macedonian association had given wings to the emigrants of Macedonian descent: amongst other things, they also announced initial activities in the national, cultural, and spiritual fields. The Macedonians living in these cities took part in the traditional multi-cultural festival, showing their folklore and national characteristics. Traditional Macedonian music, songs, and dances, accompanied by Macedonian specialties were presented to the Canadians, for which many compliments were received. In addition to this, Macedonian emigrants living in the area, began organizing dances and other cultural manifestations, raising funds which they donated to the central hospital in Cambridge. This gesture impressed the Canadians. Later, the Macedonians began collecting donations for construction of a Macedonian orthodox spiritual and national centre. This activity of the numerous enthusiasts of Macedonian descent living in Cambridge proved to be quite fruitful. Thus, negotiations for the purchase of a building of the Koptska orthodox church in Cambridge began in 1994. On 15 August of the same year, the church was purchased and redecoration into a Macedonian church began immediately. The complex consists of a church, baptistery, hall for smaller church rituals, festivities hall, class room, library, priest’s room, and parking lot. The new Macedonian orthodox church was named “Sv. Mala Bogorodica.” It’s foundation was approved by the Holy archpriest synod of the MOC and it joined the family of Macedonian churches in Canada. The church was immediately prepared to serve the Macedonian emigrants. The first religious service in Macedonian was held in September, 1994 by archiepiscope g.g. Mihail, head of the MOC at the time. At the same time, during this visit, g.g. Mihail and the metropolitan, Kiril, met with a large group of emigrants of Macedonian descent living in Cambridge and the surrounding areas. This meeting left a deep impression in everyone, encouraging them to take even greater activity in the spiritual, cultural, and national field. Thanks to the numerous donations, particularly those of the management of the MOC “St. Clement Ohridski” in Toronto, as well as other Macedonian orthodox churches throughout Canada and the USA, very soon sufficient funds were raised to pay off the mortgage. Later, in April of 1995, a Macedonian priest arrived in their community. The arrival of the priest meant an increase in activities within the church and in the national, cultural, and educational field. Initially the women’s club, and later the folklore group, both played a significant role in increasing, deepening, and enriching activities, organized dances, evenings, bazaars, and other social events. One of the most significant periods in the history of the MOC “Sv. Mala Bogorodica” was by all means September of 1996, when the church was consecrated. This act, having a church and national character, was conducted by the head of the MOC, g.g. Mihail, in service with many priests, and in the presence of more than 2,000 Macedonian emigrants and their friends, who had gathered to bless and set the foundations of the future all-Macedonian life in Cambridge. Today, the MOC “Sv. 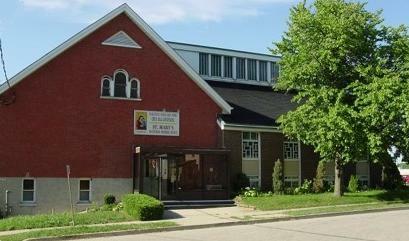 Mala Bogorodica” is a place of spiritual peace for the Macedonians of Kitchener, Waterloo, Cambridge, and Guelph. It is a meeting place for both, young and old, and a place where they continue to nurture Macedonian customs, traditions, language, and love for their native Macedonian land. Ever since the restoration of the autocephalous status of the Macedonian orthodox church, there have been numerous attempts to retrieve these churches - built using funds of the Macedonian emigrants, yet under foreign jurisdiction - but unfortunately, without success. Such occurrences and years’ long uncertainties and struggles of the Macedonian emigrants to become owners of the churches they built with their own funds, lead to deep disappointments. For this reason, certain Macedonian emigrants - running from assimilatory pretensions, and as a result of the influence upon the youth in schools, as well as the religious lack of interest and indifference of parents toward their religion, language, and traditions - began attending the Anglican and other orthodox and Protestant churches. Nevertheless, this kind of situation at the same time strengthened the emergence of a true love toward Saint Clement’s Macedonian Orthodox Church, as well as the determination to build true spiritual, national, and all-Macedonian centres. This was particularly emphasized following the constitution of the Republic of Macedonia in 1994, which was accepted by Macedonian emigrants from every part of Macedonia as their own national state and one part of Macedonia. This historical act of establishing a Macedonian state with all of its attributes: state, nation, language, religion, history, culture, literature, science, folklore, traditions, and other characteristics, and the later declaration of the Macedonian orthodox church and its autocephalous status, all meant a huge turning point among a large part of the Macedonians, misled by propaganda of the neighbouring countries. This was, in fact, the beginning of a new age and period of prosperity for the Macedonians in the USA and Canada.